Population First invites the media to send in their entries for the fifth Laadli Media and Advertising Awards for Gender Sensitivity – Western Region. The Western Region Awards are open to advertising and media professionals/freelancers from Daman & Diu, Goa, Gujarat, Maharashtra and Rajasthan. News features, articles, editorials, Op-eds, investigative reports, human interest stories from print and electronic media and ads and jingles from the advertising agencies for products, services and public service announcements are considered for the awards. h) Voice the experiences of survivors of gender violence . Multiple entries, across categories, are encouraged from individuals and media houses (group entry). The entries should have been published/broadcast between 1st January 2012 & 30th June 2013. The winners will be chosen by a jury comprising of eminent personalities both from the media and social sector. The last date for receiving entries is 15th September 2013. The awards ceremony for the Western region will take place along with that of the Northern region in New Delhi, in November. 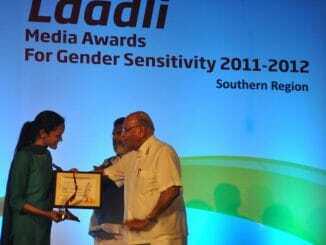 This award is given to journalists and other media personnel who show sensitivity while reporting on gender issues. Vaishnavi Vittal, a journalist from Bangalore, is one of the 22 people chosen for the award.